Paul Connett, executive director of the Fluoridation Action Network (FAN), told me, during our fluoride debate, that he was writing a scientific paper defining a lower safety limit for fluoride than currently accepted. Nothing has been published yet – although a recent FAN newsletter did refer to a risk assessment paper by him and Bill Hirzy currently under review. I look forward to reading this paper, but I am not holding my breath as neither author has an impressive publication record. 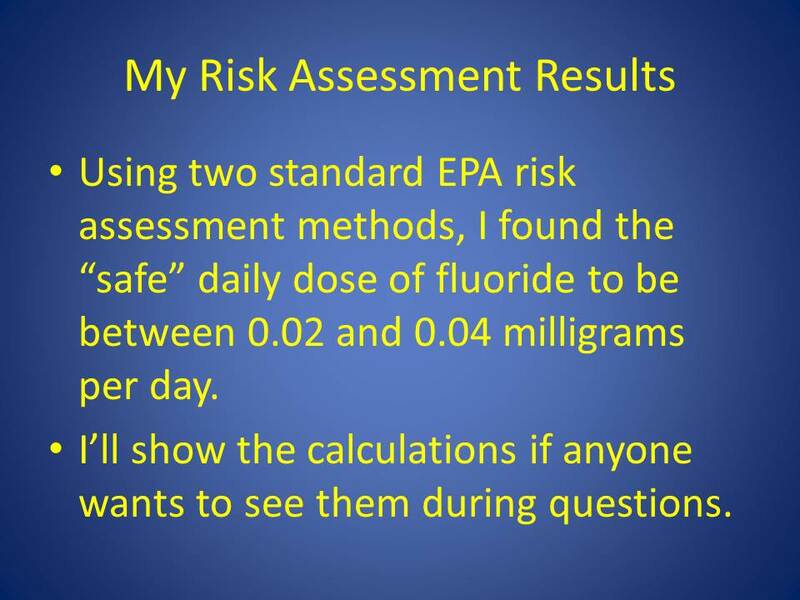 Connett described his risk assessment for fluoride in the debate (see Fluoride debate: Paul Connett’s Closing statement) and he and Hirzy have also made comments on this lately. They are rejecting the current risk assessment, based on the incidence of severe dental fluorosis, and using the incidence of IQ deficits instead. To this end, they are heavily promoting the work of Choi et al., (2012) and Xiang et al., (2003) (which reported IQ deficits in areas where fluorosis is endemic). They are also attempting to rubbish published research (such as Broadbent et al., 2014) which show no significant IQ deficits at fluoride concentrations used in community water fluoridation. Connett and Hirzy have also organised campaigns to congressional representatives in their effort to force a downward revision of the Environmental Protection Agency’s (EPA) standards for fluoridation. Connett’s approach is a desk study – these guys are not going to dirty their hands by doing their own research to get useful data. They are taking a value which they claim represent the lowest concentration of fluoride in drinking water below which no IQ deficit was found. They then apply “safety factors” to effectively conclude the only safe concentration is zero (see Scientist says EPA safe water fluoride levels must be zero)! I will be a bit surprised if they manage to squeeze their paper though a decent review process because their approach is shonky. Look at the way they use the data from Xiang et al., (2003). (I have used the presentations by Connett and Hirzy at last February’s Sydney anti-fluoride conference as sources here). As I pointed out in Connett fiddles the data on fluoride, this data actually does not show a strong relationship between IQ and fluoride. The figure (from Xiang et al., 2003) shows the relationship between IQ and urinary fluoride and, in this case, the fluoride explains only about 3% of the variance in IQ. Despite being statistically significant (p=0.003) this is certainly not evidence for a causative relationship. Clearly other, unconsidered, factors contribute to the variance and if these were considered the relationship with fluoride may be non-significant. (Readers may notice the figure uses data for urinary not drinking water fluoride. Unfortunately, Xiang did not give a similar figure for fluoride concentration in drinking water. I have contacted him requesting the similar data for drinking water but so far have not had a meaningful response. Xiang did report drinking water fluoride is well correlated with urine fluoride so the above figure probably gives a good idea of the variability in drinking water fluoride as well). Connett and Hirzy effectively ignore the high variability in the data and rely on a trick to get this second graph. By splitting the concentration range into groups and taking the mean IQ for each group they make the situation look a lot more respectable. Who would guess from this trick that fluoride only explained about 3% of the IQ variance? Connett illustrates his next step with this slide. 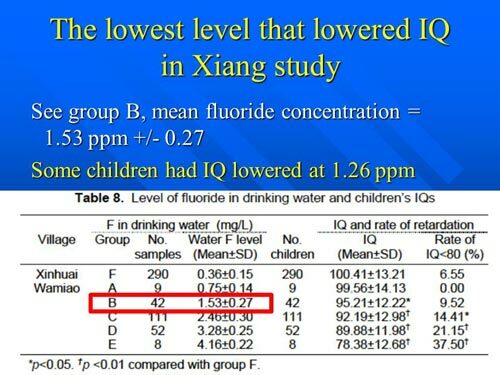 He then claims that IQ deficits occur at a fluoride concentration of 1.26 ppm – he appears to have simply subtracted the value of one standard deviation from the mean of the lowest concentration group associated with a significantly different mean IQ to that of Xiang’s “control” group – Xinhaui village. That is strange because surely the first figure indicates that low IQ values occur even for children with very low urinary fluoride, and most probably drinking water fluoride. Connett then uses a safety factor of 10 (“to account for the wide range of sensitivity expected for any toxic substance in a large population”). Of course, this produces a maximum “safe” concentration of 0.13 ppm – which rules out all fluoridated water – and most natural water sources! Connett goes on to promise his offsider, Bill Hirzy, will elaborate on the method they issued. Hirzy’s presentation did mention fluoride intake from other sources besides water. He then presents his conclusion on what the “safe daily dose” is fluoride – but no explanation of why! All the preceding slides in his presentation where self-justifying descriptions of his qualifications, employment history and how great his organisation, FAN, is. 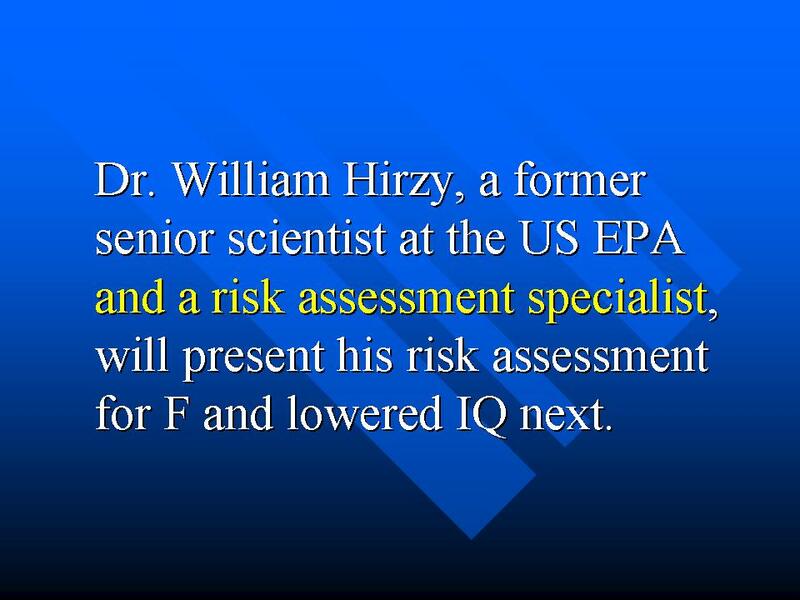 Connett and Hirzy are claiming IQ deficits are more important than dental fluorosis for setting of maximum fluoridation levels in drinking water. They are campaigning to get this accepted by legislators and the EPA. Connett has been promising publication in a scientific journal for several years and recently implied that a paper is under review. If their publication efforts are successful a more critical assessment of their approach will be possible. Available information indicates Connett and Hirzy have no original data but are relying on data from a study of children in an area of endemic fluorosis in China. They are refusing to accept published information from areas where community water fluoridation exists. Their analysis also appears to rely on a tricky processing of the data to obscure the fact that fluoride probably only explains about 3% of the variance in IQ measured by the Chinese researchers! Legislators and policy makers would be foolish indeed to make changes to fluoridation standards on the basis of such data and poor analysis. I could, of course, be wrong so eagerly await the Connett & Hirzy (2016?) paper. This entry was posted in Health and Medicine, SciBlogs, science, Science and Society and tagged Connett, FAN, fluoridation, fluoride, Hirzy, SciBlogs. Bookmark the permalink. Ken, fluoride is cleared from the blood by being sent to the bones or the urine or other organs, teeth included. Greater intake correlating to greater urinary excretion is only part of the picture. I ask if you know of any data for which the subset of people with dental fluorosis and their degree of that can be checked against urinary fluoride within the subset.. I am hypothesising that they are not so good at urinary excretion of fluoride. For the people who do not have dental fluorosis I hypothesise that they will have a stronger correlation of drinking water fluoride to urinary fluoride. For the subgroup with fluorosis possibly they have a lesser correlation of fluorosis to urinary fluoride within their subgroup. Then that subgroup can be checked for fluorosis – IQ correlation. Look at the part of the graph for this subgroup before the fluorosis gets to the stage where you want to claim appearance may be causing any IQ effect. Brian, I do not “want to claim” anything. That would be confirmation bias. But WTF has this to do with my post which is about the shonky methods used by Hirzy and Connett? Or are you in avoidance mode again? Connett…..you gotta love him. When science has the audacity to not conform to his viewpoint, no problem……he just fabricates his own. So, Greenbuzzer, I will take it that you actually cannot fault my critique of the Connett & Hrizy approach as you are trying to divert? But, if this is their approach it will be difficult for them to get past a genuine peer review process. So perhaps they will just publish in the captured journal “Fluoride” – which will be an acknowledgment of their ant-science approach. Of course, if I am wrong then Connett or Hirzy could reply here – they know I am open to good scientific discussion. Steven Slott – You seem to see fabrication in everything that questions the evidence on which community water fluoridation is founded. Given the calibre of many of those opposed to the practise and the fact they are not beholden to industrial entities with vested interests there is a distinct probability they might be right and you and your fellow zealots are wrong. I realise that must be a horrific outcome to contemplate but history is replete with examples of such events happening. Indeed you recognise that with your comment; ” When science has the audacity to not conform to his viewpoint, no problem……he just fabricates his own”. I suggest you consider that statement and ask whether it may apply to yourself or are you stuck in the 1940s? Trevor, science is evidence-based. It is not unsubstantiated personal opinion-based. Unlike you, I can provide valid facts and evidence to support my claims. Should you ever understand the importance of this, and get to that point yourself, you may have something of intelligence to add to a fluoridation discussion. Until then, you don’t. Given the calibre of many of those opposed to the practise and the fact they are not beholden to industrial entities with vested interests there is a distinct probability they might be right and you and your fellow zealots are wrong. Unpack that ^ and you will understand how Trevor sees the world: It’s a conspiracy! Drill down far enough and all science deniers fall back on the Konspiracy explanation. Trevor Crosbie wrote Steven Slott – You seem to see fabrication in everything that questions the evidence …blah blah…. From one who claims 70 years of scientific research and consensus is fabricated. Oh the irony, is it hilarious or tragic? Ken: “But WTF has this to do with my post which is about the shonky methods used by Hirzy and Connett? To rise cakes bakers use several things. Sodium bicarbonate releases carbon dioxide when heated. Baking powder combines sodium bicarbonate with an acid like tartaric, and that starts the release when moisture is present. Sometimes a bit of baking powder and some sodium bicarbonate may used in the same scones or whatever. Or some tartaric acid may be added with the bicarbonate. Say a scientist knows nothing of what is happening and is given ingredients and measures rise. This can be complicated by how long the mixture is left sitting before baking. Baking powder CO2 starts evolving straight away and may escape before before the scone structure gets set by heat. Rise will be found to relate to the various unknown ingredents. It will relate to the acid over the *range* before the point at which all the bicarbonate is used up. I don’t quite understand the ranges you refer to yet, but it seems to me that anything having a result in a range could have meaning. So I referred to subgroups. I think you are too hasty to write that off as off-topic. Unlike baking where we know most of the mechanism we do not know what is going on with IQ. What happens in ranges or between ranges might give us hints. Since the flavour of the moment is discussing “offense,” is that intended as offense, or what, Ken? So do high IQ values. But the middle is shifting down. “getting the hands dirty”, could be just a way of banter between theoreticians and practical scientists. Or Ken could even just be saying this is not new experimental work. But theoretical scientists can spend their lives applying maths and interpretation to others’ work and so making more use of the data which was costly to get. What is offensive is sometimes because of how the receiver sees it than what was intended. Same as some people can tolerate very little natural sunlight and some not even even strong light. A factor of 10 can be standard practice in toxicology. If that cannot be achieved some people may have to be moved away or otherwise protected. With radioactivity the safety limit is different for workers from what it is for the general population, which probably applies with other harming agents. How are you getting 3% Ken? I presume somewhere there is a correlation of about 0.17? Where, if you might speed up my search, please?